Oh how we miss Hammer Films. They may have been very much a movie production company of their time who in their later days weren't terribly good at anticipating the direction the horror genre was about to take, but nobody made films like them. 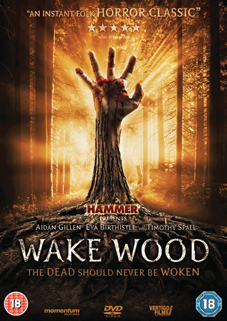 They enjoyed a number of spotty revivals in the 1980s with the TV series Hammer House of Horror and Hammer House of Mystery and Suspense, but after 30 years as fond memories and movie revivals, they're back in the feature film production business, and their latest, Wake Wood, comes to UK cinemas and DVD in March. Directed by David Keating from a script by producer Brendan McCarthy, Wake Wood stars BAFTA nominated actors Aidan Gillen (The Wire), Eva Birthistle (Middletown; Ae Fond Kiss) and Timothy Spall (Pierremont; The King's Speech) in a contemporary story of the occult. In an attempt to cope with the grief and despair of losing their only child Alice (Ella Connolly), mauled to death by a savage dog, veterinarian Patrick Daly (Gillen) and his pharmacist wife Louise (Birthistle) move from the city to the remote Irish village of Wake Wood. With Patrick taking over the local vet's practice and Louise working in the village chemist store, the couple soon become friends with many of the local landowners, farmers and their families. Their acceptance as members of this small but close community leads them to the discovery of an ancient pagan ritual practised by the people of Wake Wood in order to help ease the sudden loss of a loved one. This tradition, secretly preserved for many centuries, enables the grief-stricken to bring a deceased person back from the dead for a period of three days within one year of their passing, allowing them to say a final farewell to the departed before they make their final journey to the spirit world. For Patrick and Louise, this represents a miraculous opportunity to see Alice one more time and their request for the villagers' help in realising their wish is reluctantly granted. But the ritual is bound by strict rules and conditions, which, if broken, demand a terrible price be paid.